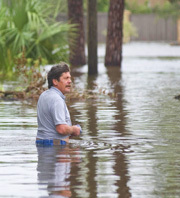 Texas resident wades through high water from Ike. The city of Austin has been taking in evacuees fleeing Hurricane Ike from Galveston for days now. We hear an update from Mayor Will Wynn as the storm passes through Texas.